We already talked a bit about the Primecoin (XPM) alternative cryptocurrency and have mentioned that it has good potential for growth, so it might be a good idea to mine some XPM now and keep them with the idea that the exchange rate will increase along with the interest in this crypto currency over time. 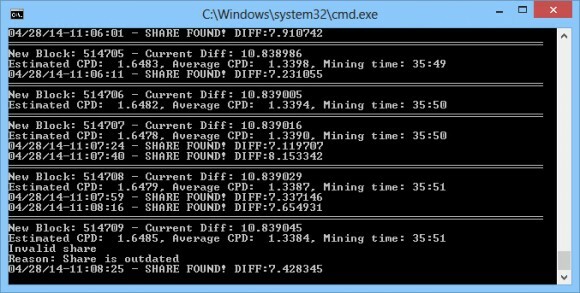 At the moment Primecoins can only be mined with the CPU of a computer, so you can combine Primecoin mining on the CPU with Litecoin mining on the GPU on the same system and make some extra profit from that if you are already mining LTCs on one or more computers. You can of course mine XPM on pretty much any computer, but the more powerful the processor is the better and the same goes for the number of cores, the more – the better. We’ve decided to give it a go with two systems using different processor for 24 hour time period in order to see what profit we are going to make. Both of the systems are mining Litecoin on the GPU, but that does not interfere as long as you set the cgminer processor affinity to just a single core if using Windows. We have decided to use one of the biggest Primecoin pools for the test – ypool, though the pool also offers other alternative cryptocurrency mining options. A little over $1 USD per day does not seem that much of a profit for the moment, but that is only if you sell the Primecoins now, the wise idea however would be to mine now and save the coins for later, expecting to the exchange rate to go sky high. Anyway, it is up to you to to decide if you want to mine and sell now or mine and save the coins for later.